Elevator Control System ,full programmable to ant application control and drivre system,uml21lv,umf31lv,umf,umf-31ת,uml,uml31,uml-31,uml-31lv,uml11,uml-11,uml11a,uml-11lv,elv5,elv-5,elv-51lv,uml-51lv,lift controller,UML-51R,controller,UML-51F. 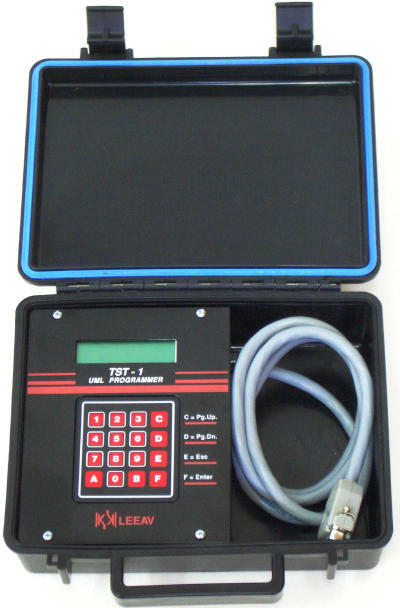 , TST Portable Programmer & Diagnostic. Important! You must disconnect power from the UML master print before connecting it to the TST- Connect the TST-1 to the D-Type 15 pin connector on the UML card. Do not carry out this step while the card is connected to the power source. The display mode presents a complete and updated record of the last thirty Failures and Events, and the current status of inputs and outputs as the microprocessor identifies them. The display mode may be used while the elevator is in motion without affecting the operation of the elevator. The display mode is a basic mode, which is accessed without the use of a code. The name of the failure The floor on which the failure occurred (indicated on right hand side of screen). The input relevant to the failure The segment relevant to the failure (the floor indicator on the UML card also functions as a failure indicator, the relevant segment blinking to indicate type of failure). The last thirty events are presented in the same format as the last thirty failures. The name of the Event The floor on which the Event occurred (indicated on right hand side of screen). The input relevant to the Event The segment relevant to the Event (the floor indicator on the UML card also functions as a failure indicator, the relevant segment blinking to indicate type of failure). The last thirty events are presented in the same format as the last thirty failures. 3. Inputs: All available inputs are displayed. 4. Outputs: All available outputs are displayed. 5. Cabin Calls Mode: Entry to the cabin calls mode (via the display mode) enables cabin calls to be made (Down calls and Up calls) directly via the TST. The programming mode is accessed only through the use of your own private code. This security feature is necessary because the programming mode enables changes to be made to timers, parameters and the status of the lift. Important Note: all cards are provided with the factory code 0000. These four digits are Replaced by the digits of your own personal code during one of the stages of the programming mode. It is recommended to Connect the Tst Without power to the master card and operate the programming mode only when the elevator is out of operation. Use the programming mode while the elevator is in motion, will trigger the emergency stop.